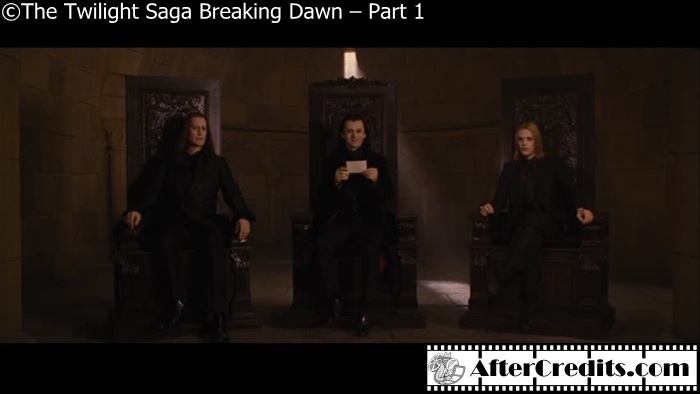 After the main credits, in a gothic vault, Bianca delivers a note to the Volturi, led by Aro. He corrects her spelling (“Its Carlisle with an S”), then she is dragged away. Aro makes a remark about “First the spelling goes, then the grammer” and confers with his right hand man, who says “So, our dispute is over”. Aro replies “Goodness, no. I thought you understood – My dispute the Cullens goes far beyond the fate of a mere human. He has something I want”. Then the screen goes black.